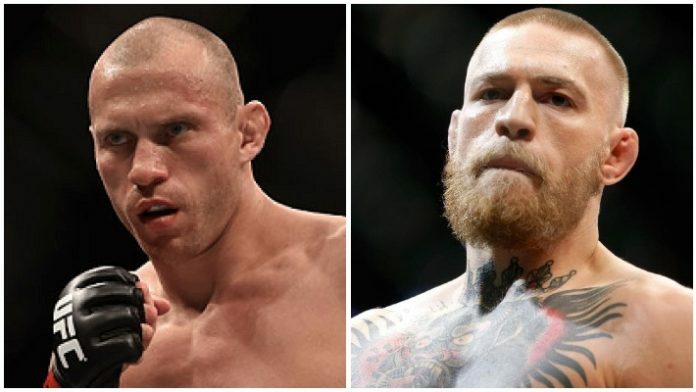 After knocking out Alexander Hernandez in the main event of the UFC on ESPN+ 1 prelims this past Saturday in Brooklyn, New York, I tweeted that Donald Cerrone should use his post-fight interview as an opportunity to call out Conor McGregor. Sure enough, Cerrone did just that, telling the Irish superstar that he wants to fight him. McGregor responded in kind on Twitter, first praising Cerrone for his tremendous performance against Hernandez and agreeing to fight with him. This is a fight that makes too much sense for the UFC not to book. It’s fallen right into their laps, and the response from fans and media has been overwhelmingly positive for this potential bout. Both Cerrone and McGregor are two of the most popular fighters in UFC history, not to mention two of the most exciting. Both are also at the crossroads of their career, with Cerrone having moved back down to lightweight for one final title run and McGregor hoping to get another crack at the belt following his beating at the hands of Khabib Nurmagomedov back at UFC 229. This fight makes so much sense, and it’s an easy booking for the UFC. The problem with the UFC not being able to put pen and paper this to this fight immediately is that McGregor is still currently suspended by the Nevada State Athletic Commission for his role in the post-fight brawl at UFC 229. That incident took place last October, and we still have no idea what the punishment for Nurmagomedov and McGregor will be. At the time, a lot of us were thinking they both might get a couple of months on the sidelines. Well, it’s four months later now and we still have no resolution. And until we do get an answer, it’s impossible for the UFC to book McGregor, which is unfortunate because he appears ready to fight again soon. The good thing about McGregor accepting this fight against Cerrone is that it means no rematch with Nurmagomedov. A lot of fans for whatever reason have an inkling to see those two go at it again despite the fact McGregor was big brothered in that fight. If McGregor fights Cerrone instead, that leaves Nurmagomedov free to defend his belt against the two top contenders in the lightweight division, Tony Ferguson and Dustin Poirier. Those two are extremely deserving of title shots, far more than McGregor is, and if Nurmagomedov isn’t matched up in a rematch then he’ll have to fight one of them, even if his manager Ali Abdel-Aziz is still calling for the McGregor rematch. So not only would we get a Cerrone vs. McGregor fight in this scenario, we would also get Nurmagomedov against Ferguson or Poirier. That’s a win-win. Getting back to Cerrone, he has earned this money fight against McGregor, which would be by far the biggest paycheck of his MMA career. Considering Cerrone has been a company man and has fought the who’s who of the lightweight and welterweight divisions for over a decade in the WEC and UFC, it’s time for him to get a huge push and get this fight against McGregor. For all the good he’s done in his career, Cerrone has never had the chance to fight a true superstar in a pay-per-view main event and make a ton of money doing so. Fighting McGregor would obviously be just that. Again, until we figure out how long McGregor is suspended for then it’s hard to fantasy matchmake for him. If he’s going to be out a year and not be able to return until October, then perhaps Cerrone can fight someone else in the meantime. But if McGregor is going to be cleared to fight soon, then he should fight Cerrone in his return fight. It’s a fan-friendly matchup between two of the most exciting lightweights in the game, and both guys want it. The UFC has had this big fight fall right into their laps, and now it’s up to the UFC to book the fight the fans want to see. Matchmaking has never been easier than when two of your company’s stars are calling each other out on social media, and hopefully the UFC listens to the fans and books the fight that everyone wants to see whenever it’s possible.